In This Land That I Love, John Shaw writes the dual biography of these beloved American songs. Examining the lives of their authors, he finds that Guthrie and Berlin had more in common than either could have guessed. 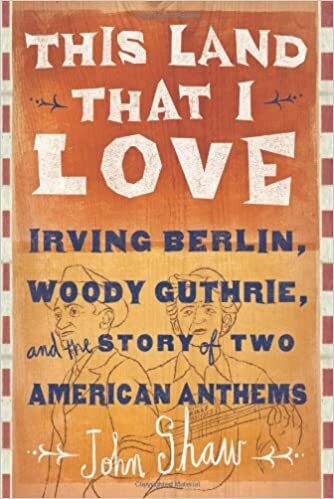 Though Guthrie’s image was defined by train-hopping, Irving Berlin had also risen from homelessness, having worked his way up from the streets of New York. At the same time, This Land That I Love sheds new light on our patriotic musical heritage, from “Yankee Doodle” and “The Star-Spangled Banner” to Martin Luther King’s recitation from “My Country ’Tis of Thee” on the steps of the Lincoln Memorial in August 1963. Delving into the deeper history of war songs, minstrelsy, ragtime, country music, folk music, and African American spirituals, Shaw unearths a rich vein of half-forgotten musical traditions. With the aid of archival research, he uncovers new details about the songs, including a never-before-printed verse for “This Land Is Your Land.” The result is a fascinating narrative that refracts and re-envisions America’s tumultuous history through the prism of two unforgettable anthems.